New York (January 12, 2017) Oberon Fuels, a producer of clean-burning Dimethyl Ether (DME) transportation fuel, today announced the commencement of the first-ever customer demonstration of a DME-powered Mack truck, a Mack® Pinnacle™. Oberon and Mack are working with the NYC Department of Sanitation (DSNY) to run the vehicle at the Fresh Kills Landfill and evaluate performance and overall drivability. 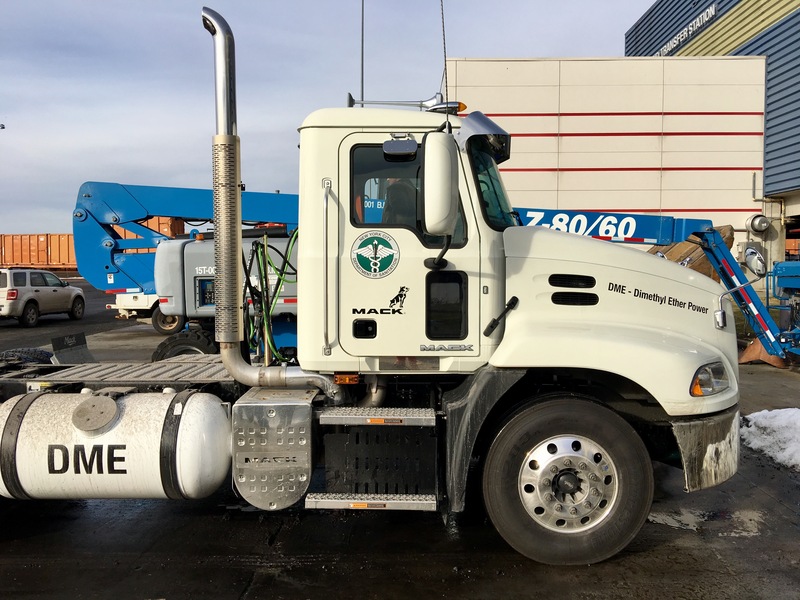 The test is the first step in the city’s evaluation of both DME trucks and DME fuel as a potential long-term strategy to help reduce greenhouse gas emissions by 80 percent by 2050 and to achieve the city’s goal of sending zero waste to landfill by 2030. The goal of the demonstration is to gather data on the use of DME fuel and vehicles in urban, heavy-load fleets. At scale, such a program could convert hundreds of thousands of tons of organic waste into clean fuel, reducing emissions, waste, and costs for cities while improving overall air quality and creating jobs. DME fuel, which is approved for use in all 50 states, delivers the same exceptional performance as diesel and burns cleanly without producing any soot. DME emits zero soot, which can lead to substantial health improvements in areas where air quality is a high concern. When produced from local organic waste, DME can reduce greenhouse gas emissions by 68-101 percent compared to diesel as calculated by the US Environmental Protection Agency and recently published by US Department of Energy’s Argonne National Laboratory. These greenhouse gas reductions make it one of the first fuels for heavy-duty trucking that can result in a net CO2 reduction. DME engines are also easier to maintain, offer excellent cold weather performance, and run quieter than diesel counterparts. The vehicle being tested is a Class 8 Mack Pinnacle model truck equipped with a 13-liter engine. California-based Oberon Fuels monetizes biogas and industrial waste streams by converting these feedstocks into higher valued commodities. Using its proprietary small-scale process, Oberon makes DME, a clean-burning diesel alternative, from methane and carbon dioxide. In 2013, Oberon Fuels’ pilot plant in Brawley, California produced the first fuel-grade DME in North America, which is currently being used by Mack Trucks and Ford Motor Company. More information about Oberon Fuels, is available at www.oberonfuels.com. The Department of Sanitation (DSNY) promotes a healthy environment through the efficient management of solid waste and the development of environmentally sound long-range planning for handling refuse, including recyclables. The Department operates 59 district garages and manages a fleet of more than 2,000 rear-loading collection trucks, 450 mechanical brooms and 500 salt/sand spreaders. The Department clears litter, snow and ice from approximately 6,500 miles of City streets and removes debris from vacant lots as well as abandoned vehicles from City streets.